On Friday Mary Kay and John Evans were inducted into the PCC-Fremont Campus Hall of Fame. There are quite a few examples of excellence to share this week. I'll begin by congratulating board secretary Mary Kay Evans upon her and her husband John's induction into the Pueblo Community College-Fremont Campus Hall of Fame. John and Mary Kay were honored for their decades-long involvement in expanding educational opportunities for area youth and adults. Congratulations! On Thursday evening I attended a public viewing of the award-winning movie Most Likely to Succeed. This presentation was arranged by Tiger Open Pathways students Neva Carriger, Fiona O'Dowd White, and Destene Taylor. The movie paints a pretty accurate picture of what we are trying to accomplish through the TOP program, allowing students choice in their learning based on areas of personal interest. The movie was thought-provoking, and the TOP student project work on display definitely made the evening worthwhile. What a great evening of learning! Last week Cañon City High School/Pueblo Community College students Wyatt Cosat and Cam McFarland represented us at the Colorado State Welding Championships. Both produced outstanding work and Wyatt’s Cosat's sculpture garnered 2nd place honors. Congratulations go out to him, and to Cam for qualifying to attend, as well as to PCC/CCHS Welding Instructor Extraordinaire Daniel Vinci! Mr. Vinci's expertise, dedication, time, and effort are truly appreciated. 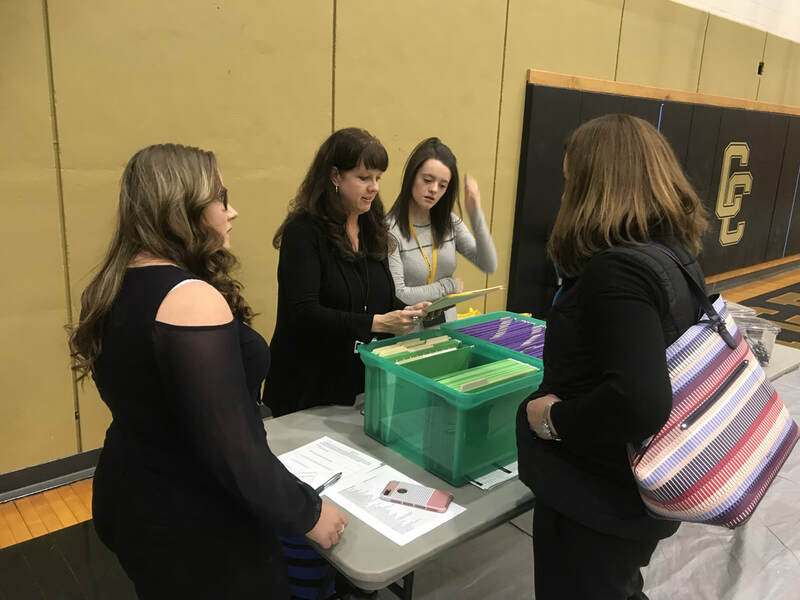 If all the above were not enough to burst the buttons right off your shirt with pride, Regional Intern and Apprentice Coordinator Lisa Tedesko was once again able to convince a large number of area employers to attend our spring job fair. 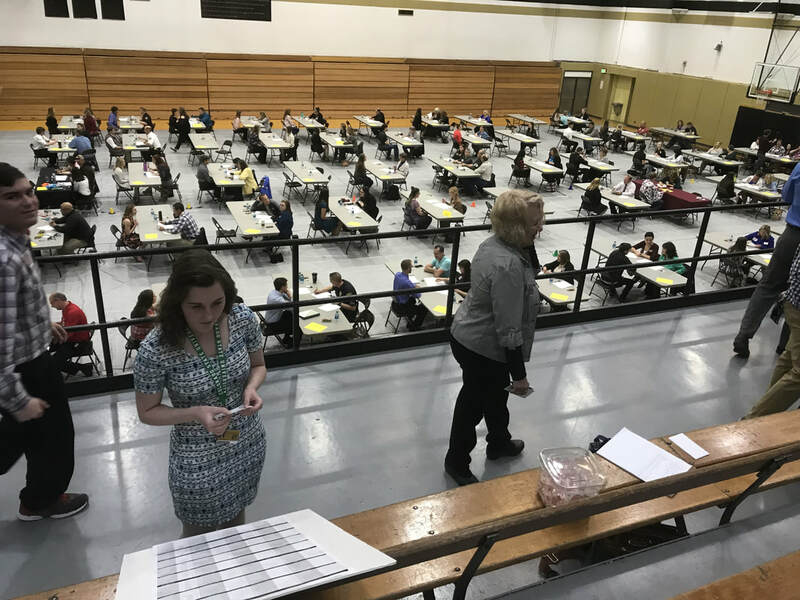 This gave nearly 100 CCHS students an opportunity to participate in as many as 5 job interviews each! Last year this event fit nicely into the Cañon City High School Library. Because of the tremendous growth of the program, we had to move it to the Tiger Dome this year. Thank you once again, Lisa! Lisa Tedesko guides students to their 4th interview of the day. The Tiger Dome was packed with 54 local business partners. 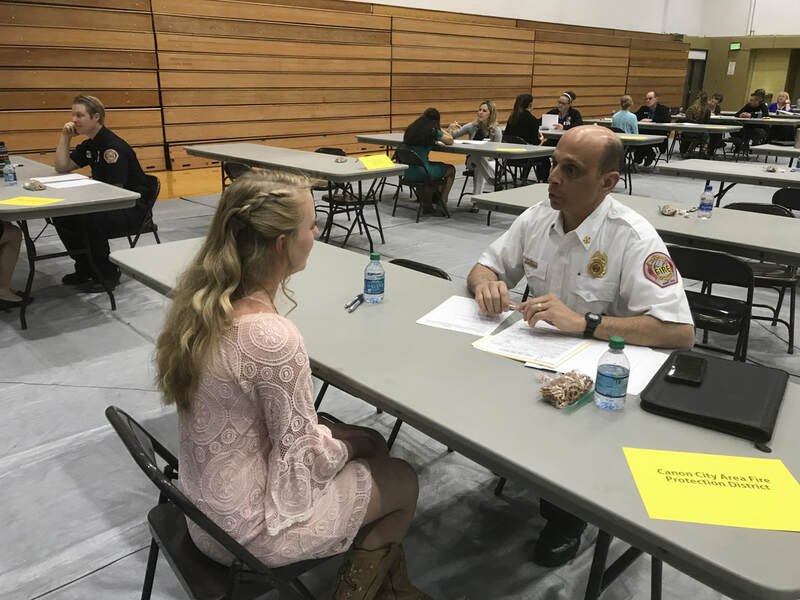 Fire Chief Dave DelVecchio interviews a possible intern. Board Vice President Lloyd Harwood testifies about the importance of the BEST program to districts like CCSD. Last Wednesday CCSD Board Vice-President Lloyd Harwood and I were in Denver to testify in favor of legislation that would apply more of the marijuana excise tax Colorado collects to the Building Excellent Schools Today program. The bill passed out of the Senate Education Committee on a unanimous vote and now heads to the Senate Finance Committee. Last Monday I had a pleasant meeting with Dr. Patty Witkowski, Assistant Professor of Leadership, Research, and Foundations at UCCS and Julie Jardon, Director of Student Services at Pueblo Community College. They were offering to support our counselors in work being done to introduce middle and high school students in the possibility of college life. We are excited about their willingness to help us engage parents about students possibly attending college. On Monday afternoon Director of Instruction Adam Hartman will guide me and our Board of Education through a visioning process as we hold a half-day retreat. The purpose of this work is to set a long-term course for the district. Tiger Open Pathway students shared and explained their project work to movie attendees. 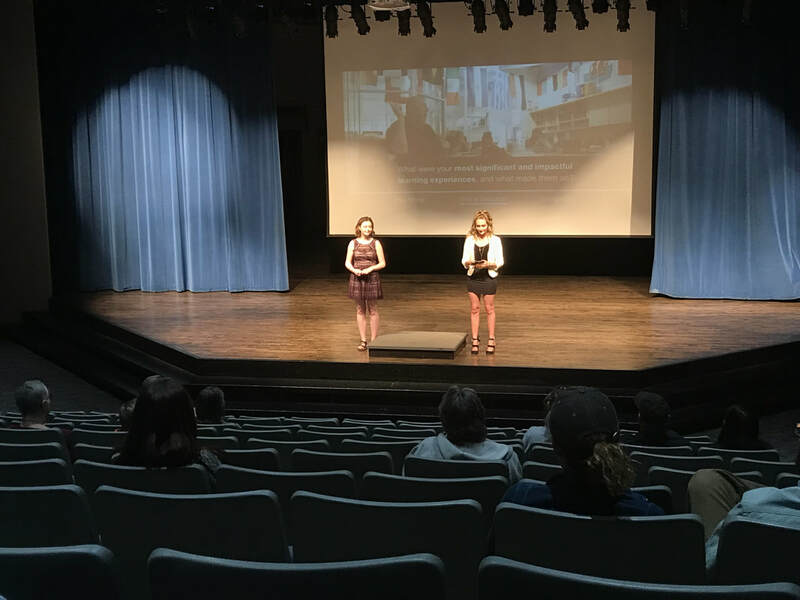 TOP students Fiona O'Dowd White and Neva Carriger introduce the film Most Likely to Succeed. We took a big step toward our Cañon City High School one-to-one device implementation by hiring Daniel Coppa to be our new Educational Technology Coordinator. Dollars for his salary have been budgeted out of override proceeds and Mr. Coppa will play an instrumental role in supporting CCHS teachers in the use of Chromebooks to support instruction. Daniel Coppa will be our Educational Technology Coordinator. Design work continues on our safe school entries at CCHS, CES, Harrison, Lincoln, and McKinley. We are also getting drawings done for replacement cabinetry in Lincoln and McKinley classrooms. This will be installed after old casework is removed to replace water delivery systems. CCHS roof work continues and I believe panic button systems installed at Lincoln and McKinley are now fully operations. Wyatt Cosat, Cam McFarland and Mr. Vinci wait for awards announcements at the Colorado State Welding Championships. Early last week I submitted district and school Unified Improvement Plan updates to the Colorado Department of Education. I also communicated details about our growth and development curriculum to an interested community member. I also met with Dan Morris from Colorado Digital Learning Solutions about online coursework that could be available to CCSD students. Later in the week, I observed student policy presentations about the 5-block class schedule, ranking students, and the length of lunch periods Ms. Curl's Language Arts class at Cañon City High School. 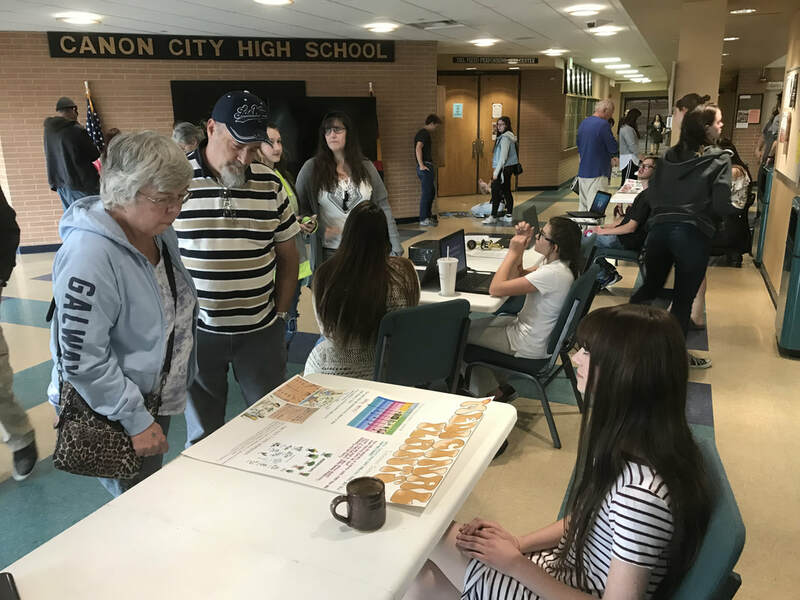 I also observed the Cañon City High School spring employer fair, held a touching base meeting with Director of Special Services Lynnette Steinhoff, attend a Cañon 2020 vision team meeting, and met with Director of Instruction Adam Hartman about the future of his department. On Friday evening I saw board director Mary Kay Evans and her husband John inducted into the PCC Fremont Campus Hall of Fame. Wyatt Cosat's 2nd place sculpture! On Monday I have a meeting with a concerned parent, board of education retreat, a board work session, and a regular board meeting. On Tuesday I begin my day at a Harrison BLT meeting, then I meet with Director of Human Resources Misty Manchester, hold a Superintendent's Advisory Council meeting, and then I'll do a practice run on a webinar I am producing with our partners at Lindamood-Bell. On Tuesday afternoon I have an Instructional Leader PLC followed by a Pikes Peak Alliance meeting in Springs that evening. On Wednesday Director of Student Support Services Paula Buser and I will attend a regional superintendent meeting in Pueblo. The focus will be school safety. I'll return to an afternoon master agreement negotiation session with CCEA representatives. On Thursday I'll trek to Denver with a number of CCHS staff to attend the Colorado Education Initiative ALP grant kickoff session. While there I'll also pop into an Early Childhood Leadership Commission meeting. On Friday I'll attend a Technology Sector meeting in Florence.